Perhaps you’re looking for a new water heater, or you’re in need of a replacement. No matter the situation, there is a tankless water heater out there for you. However, how do you know what to look for or where to look for it? Have no fear because we are here to ensure you find the best propane tankless water heater for you and your hot water needs. One of the first things you need to figure out is how much hot water you use on a day-to-day basis. If you live by yourself, then you obviously don’t use much hot water. If you’re a family of four, however, you use up a good bit of hot water in a normal day. You need to have an idea of how much you use, so you know what type of unit you need. Some units are stronger than others and can handle a higher hot water demand. You don’t want to purchase a water heater meant for one person when you need one for four people. In the world of water heaters, this is split up into two terms. There are FHR and GPM. FHR stands for first-hour-rating while GPM stands for gallons-per-minute. In layman’s terms, FHR is how much hot water the unit can produce within the first hour before having to reheat water while GPM is how much hot water it can produce per minute. Simple enough, right? Therefore, if you have a large family, you’ll want a unit with a higher GPM. We discussed earlier that a typical shower consumes 2 to 2.5 GPM. So, if you have three people using showers, you would need a unit with at least a 7.5 GPM or higher to support all three showers. Anything lower will result in lukewarm water for everyone. It is also essential to consider your climate when shopping for a propane tankless water heater. The weather can indeed affect your unit and its ability to provide you with hot water. If you live in a colder climate, you will want to search for a unit that excels in cold weather climates. By buying a unit that only works in warm climates, you have handicapped your unit already. However, if you live in a warmer climate, you shouldn’t have much trouble finding a unit that will do you service. Most water heaters out there excel in warmer climates because the warmer the incoming water is, the faster it can heat it up to your preferred temperature. Know your weather to ensure you find a good unit. We also encourage you to make sure you have proper ventilation or plans to have proper ventilation before purchasing a propane gas tank. These units do run on propane gas, and if there is a buildup of this gas in an enclosed space, it becomes very hazardous. Most of all propane tankless water heaters require proper ventilation to ensure you and your family remain safe. If your home cannot support good ventilation, then a propane tank may not be the best choice for you. Take this into consideration before purchasing one. Lastly, watch out for point-of-use water heaters. These are not bad water heaters, but these are units designed specifically for one area or two in a house and not a whole house. If you only need hot water in one area of the house, a point-of-use water heater is perfect for you because that is what it is designed to do. However, if you are looking for a unit to support your entire house, a point-of-use water heater is not the route you want to go. 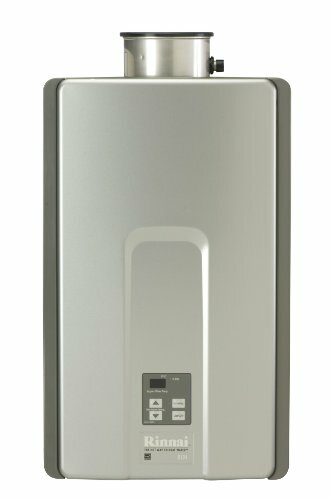 Propane tankless water heaters are an excellent choice to consider as they are still powerful units that perform extremely well. Without further ado, let’s look at the reviews. Kicking off our list is the Takagi T-KJr2-IN-LP on demand water heater. If you want power in your water heater, then this unit is a great pick. Not only can it produce hot water quickly, but it can also do so very discreetly. Most of us keep our water heaters in a closet away from busy rooms of the house because they can be quite loud. The Takagi doesn’t have that problem, however, as it runs quietly while still giving you hot water at fast rates. Speaking of power from before, the Takagi has a water flow rate of approximately 6.6 GPM or gallons per minute. This is powerful enough to run a shower and an appliance or two showers depending on what you need it for at the time. However, this number can vary depending on your local weather and climate. It’s GPM can dip down to around 3 or 4 if you live in a much colder climate as it must work extra hard to heat up the water. The Takagi unit itself weighs 38 pounds making it lightweight, but not the smallest water heater out there. This is because it is a propane water heater and so requires a larger size to cater to this fact. You’ll also need proper venting for this unit due to the propane. We recommend stainless steel venting to ensure proper ventilation of the gases. 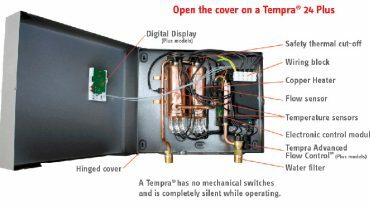 This tankless heater is also a point-of-use unit meaning that it should be installed where hot water is needed. However, this also means it is not a whole house water heater. If you want to support an entire household with multiple bathrooms, then you will need to pick up the second unit as well. 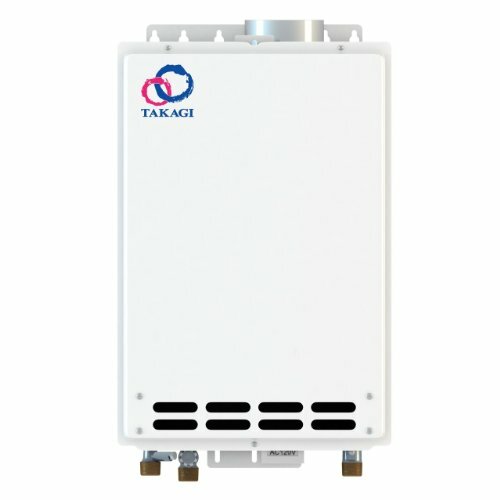 Along with this unit, it also comes with a remote that you can use to control the temperature even up to 150 degrees F.
The Takagi is a reliable water heater that can get the job done for you. If you’re looking to support a bathroom or two and nothing more, this water heater may be the right pick for you. Be sure to have proper venting before purchasing this unit and consider hiring a professional to install it as well. All in all, this propane water heater is well worth the buy. Coming up next on our list is the Eccotemp FVI-12-LP. This unit works best with smaller residential homes mainly due to its lower GPM of only 3.4. This makes it able to support a shower or even two at once, but not much more than that. If you have a large household or you use a lot of hot water, this unit may not suit your needs very well. One of the biggest issues with the Eccotemp is it is not very user-friendly. There is an LED display on the front that shows the current temperature of the water or any error messages. There are two knobs to the left of this screen that you use to control the temperature. One knob controls the usage of gas while the other controls the temperature of the water. The issue is that you must play around with both knobs to find that right temperature that you want. This could take a long time for some making it a frustrating aspect of this unit. Like many other units, the climate affects this unit as well. The Eccotemp can produce hot water anywhere between 90 and 140 degrees F. However, if the incoming water is below 65F, you may only be able to heat up the water to 100 degrees F. This can be displeasing if you live in a colder climate and you want hotter water. As far as installation goes, many people find it relatively easy to put together. The only issue is that this unit requires a 2-1/4” stainless vent pipe and that can be difficult to find for some. However, if you find one then putting it together is simple enough. The Eccotemp is a good unit that can support small residential homes, but that’s the limits of this unit. Along with that, this unit makes it difficult to change the temperature of the water with its confusing two-knob system. 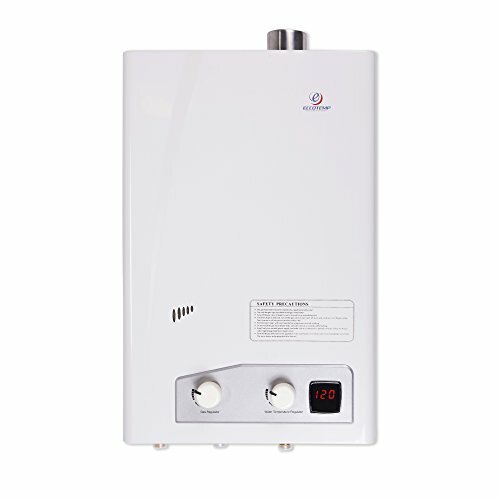 If you need a water heater for a small home and don’t mind the inconvenience, then this unit will do a good job for you. However, there are better water heaters out there that are easier to deal with and more powerful. Third on our list is the Rheem RTG-84DVP. This water heater is a solid unit that can get the job done for most of your hot water needs. It stands tall as a powerful water heater with a GPM of 8.4 though this can vary depending on location and demand. Let’s dive in and look closer at this unit. We mentioned the 8.4 GPM of this unit. In case you’ve forgotten, that stands for gallons-per-minute. If you have a large demand for hot water because of a big family or you run multiple appliances that take up hot water, this unit can handle it. Ideally, it can run two bathrooms and an appliance with relative ease and no issues. However, anything past that will cause this unit to take a dip in temperature where you may only get warm water instead. Another thing to consider is your location before purchasing. Some people have reported that their temperature varies due to the weather or even altitude. Warmer climates will typically be easier on this unit because the incoming water will be much warmer than in a colder climate. If you do live in a colder climate, expect a slight delay before you receive your hot water with this unit. It’ll take extra time to heat up the water before it reaches you. Installation requires this unit be outside because of the natural gas. If you attempt to have this unit installed indoors, dangerous gases could build up becoming a health hazard. Make sure you have proper ventilation as well when installing this unit. Along with your unit, you’ll also receive a remote control for the temperature which is a huge plus in our books. This Rheem unit is a solid water heater that is a step above most, but not one of the best either. You’re looking at a unit that sits in the middle of the pack but will still accomplish what you need it to. If you don’t mind having to install it outside and your hot water demand is not too high, then this unit can be a good fit for you. The next unit on our list is the Camplux BW264. This portable outdoor water heater is perfect for those who enjoy camping and want a hot shower at the campsite. This water heater can handle a single shower whenever and wherever you need one making it very handy for those of you who like to travel. Looking at the Camplux’s power, it has a GPM of only 2.64. As stated earlier, this is good enough for a single shower, but no more than that. The typical shower takes up anywhere 2 and 2.5 GPM so this unit reaches its limit once you’ve showered. Therefore, this water heater is not a whole house water heater, and we do not recommend it for the use of more than one person. It works best as a portable water heater for outdoorsmen. One of the more convenient aspects of this unit is the two weather modes it has. There is a winter mode and a summer mode. When placed into winter mode, it allows a hotter shower because it takes into account colder weather, thus bumping up the temperature for the water. If put into summer mode, it uses less hot water because of the warmer weather. This makes it a versatile unit that can be used in both the hot and cold climate. Another appealing thing about this unit is that it comes all inclusive. This way, you don’t have to go out and buy other parts to run this unit. Instead, once you purchase this water, you have everything you need to run this unit. This is very appealing to those who don’t want to have to deal with additional purchases after the initial buy. This unit is also very efficient and saves on energy. It requires very little gas which saves you money on gas which is another a huge plus. It’s also important to mention that this unit will need proper ventilation as all gas water heaters do. Be sure to use this unit in a properly ventilated area and not indoors where hazardous gas can build up. If you are an outdoorsman who needs a hot shower at the campsite, this portable water heater is perfect for you. It doesn’t require much gas at all and is powerful enough to give you a hot shower whenever you need one. We highly recommend this unit for those of you who are on the go very often or if you love to camp. Keep in mind, this is not a whole house heater and should not be purchased to support one. 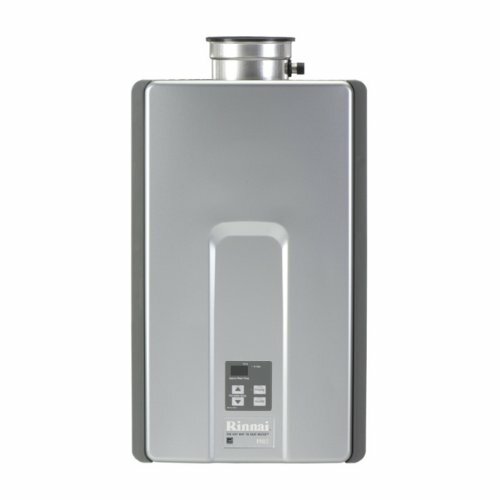 Coming up last on our list is the Rinnai RL94iP. This unit is a potent heater that can support most residential homes. While it comes in last, it is certainly not least on our list as you’ll soon see. Let’s look closer at what makes this unit a solid fit for you. First off, this unit boasts a GPM of 9.4. As we said earlier, a typical hot water shower uses anywhere from 2 to 2.5 GPM. So, this unit could handle 3 to 4 hot showers all at once. However, if you don’t want to run three showers at once, then it can support one shower and multiple appliances at the same time. This makes this unit extremely handy for families of 4 or 5 people where hot water is in higher demand. Perhaps the best thing about this unit besides its power is the fact that it is an indoor unit. That’s right! You can have this unit installed indoors making it less of a hassle to deal with than installing one outdoors. The unit comes with a digital controller and relies on electronic spark ignition. The digital controller allows you to adjust the temperature anywhere between 98 and 140 degrees F. Since it is also an indoor unit, it comes with its freeze protection system ensuring the unit does not freeze on you added another plus to this unit. 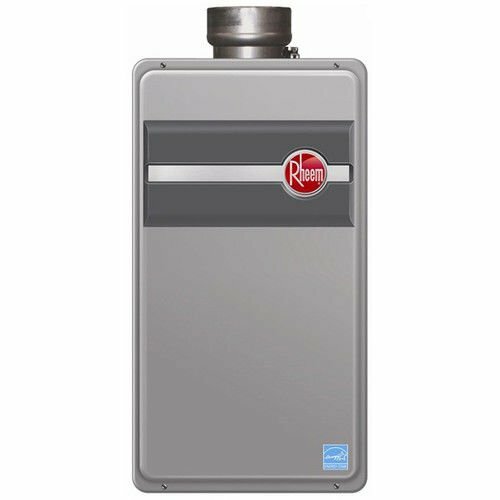 This Rinnai unit is a top of the line water heater that will get the job done for you. It can easily handle multiple bathrooms and a few appliances if needed. 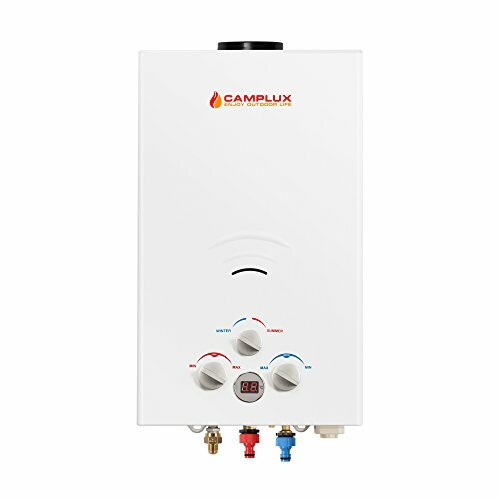 If you and your family have a large hot water demand, then this unit may be the best one for you. We highly recommend you look at this unit in your search for a water heater. To finish, propane tankless water heaters are a great option for water heaters. Unlike electric tankless water heater, propane units can provide much more power and a stronger water flow. This is very appealing when taking a hot shower. They certainly have their downsides, but all units do.